“In 1928, Lola Bobesco went to Paris to receive advice from her compatriot Georges Enescu about her further musical development. He arranged for her to play for Jacques Thibaud, who was much impressed and Thibaud arranged for Bobesco to study under Marcel Chailley at the Paris École Normale de Musique between 1928 and 1930. She continued her studies at the Paris Conservatory (1931-1935) with Jules Boucherit, where she gained her first prize in 1934, and graduated with the Prix d’Excellence. A recital début in Paris came in 1933 when she played the Franck Violin Sonata and Fauré’s 1st Violin Sonata with pianist Céliny Chailley-Richez. Bobesco made her solo début in 1936 playing the Beethoven Violin Concerto with the Colonne Orchestra under Paul Paray in Paris. The following year, 1937, she attended the Eugene Ysaÿe Competition. Ysaÿe was very close friends with Queen Elisabeth of Belgium and she initiated the Concours International de Violon Eugène Ysaÿe in his honor. This competition quickly became one of the most outstanding music competitions in the world. Bobesco played a very respectable program at the finals of the Eugene Ysaÿe Competition on 30 March 1937 in Bruxelles at Centre for Fine Arts, Salle Henry Le Boeuf. 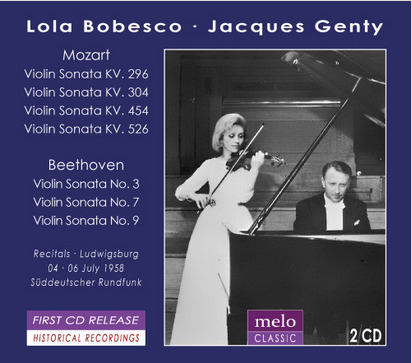 Bobesco met with the French pianist Jacques Genty, who had studied with Lazare Lévy. They immediately realised their shared musical sympathies, the friendship, rich with youthful energy, immediately took off with their duo performances of the complete Mozart, Brahms and Schubert violin sonatas cycle across the major cities in France. Bobesco also teamed up with cellist Antonio Janigro and pianist Dinu Lipatti in a trio. The three of them gave a number of performances in the late 1930s and had works by Beethoven, Schubert and Brahms in their repertoire. Genty was an active member of the French resistance, and they became married after the liberation of Paris in 1944. After they divorced twelve years later, they continued to play together and stayed good friends.